Forest ownership in the South has evolved substantially over the past decade, raising questions about changes in the landowner objectives and approaches to forest management and ultimately about the retention of forest lands. How will ownership change in the future? What are the implications for forest management and forest sustainability? In this chapter, we examine the recent dynamics of forest ownership, develop forecasts of potential future changes, and identify some implications of these changes for forest conditions and management. Although public ownership of forests in the South has grown slightly over the past 20 years, private owners continue to dominate, now holding 86 percent of forest lands in the region. Nevertheless the private group has experienced a dramatic change among commercial owners and an ongoing change dynamic within the family-held forest ownership group. Since 2000, the forest products industry—defined as landowners who also own primary wood processing facilities, such as sawmills and pulp mills—divested most of its land base (roughly 40 million acres) either by outright sale or through a change in organizational structure. New types of corporate owners, primarily timber investment management organizations (TIMOs) and real estate investment trusts (REITs), now manage these lands using business models that differ from those of previous owners. At the same time, the area controlled by non-corporate owners, primarily family forest owners, has increased, and this group is continuing to evolve in response to changing demographics and objectives. The dynamics of corporate and family forest owners within the context of ongoing urbanization and changes in landscape configuration may alter the operability of forested parcels and the desirability of holding forest lands for long periods of time. The published literature offers little information about the factors that influence forest ownership dynamics. Most studies have been either descriptive, such as general forest assessments, or they examined timber harvesting or other specific landowner activities. This paucity of information has limited forest projections systems to simple sets of assumptions about the distribution of future forest land among ownership classes. In the projections presented in other chapters of this report (e.g., chapter 5), the area of Federal forest land is held constant and land use changes are allocated among the State, local, and private ownership categories according to their current distributions—as has been the methodology of previous projections systems (Haynes 2003). Although necessary, this approach ignores the dynamics of southern ownership patterns and their resulting impacts on land use and forest management. Therefore, we have collected and applied available information from ancillary studies to augment model results and to provide better insights into potential changes in private forest ownership. Most forest assessments include some level of information on forest ownership patterns. One of the first timber resource assessments of the United States, conducted in the 1950s, included a separate chapter on the characteristics of forest owners (Josephson and McGuire 1958); and landowner information has become a standard element of other national (Smith and others 2009), regional (Wear and Greis 2002), and State-level (Conner and others 2004) forest assessments. Apart from the general descriptions, there have been many studies that have examined specific owners and/or activities. Landowner surveys, focus groups, and personal interviews are common techniques for developing a deeper understanding of private forest owners (Hodgden and others 2007). The first forest ownership studies in the United States were conducted in the 1940s (Barraclough and Rettie 1950). National surveys of forest owners were conducted in 1978 (Birch and others 1982), 1993 (Birch 1996), and 2006 (Butler 2008). Unfortunately, comparisons across these studies are hampered by variations in questions asked, subject populations, and/or methodologies. Many researchers have studied the management behaviors of specific private owners, including timber harvesting, reforestation, and timber stand improvement (Beach and others 2005); recreational access (Snyder and others 2008); forest certification (Kilgore and others 2007); biomass harvesting (Joshi and Mehmood 2010); and carbon sequestration (Fletcher and others 2009). Although their methods varied, most of the studies have taken an econometric approach to test hypotheses regarding landowner decision making. Of the studies on forest ownership dynamics, parcellation has been a dominant topic, but most studies have focused on impacts (Germain and others 2007) rather than empirically testing the causes of parcellation. The exception was a study of State-level summaries by Mehmood and Zhang (2001) that showed correlation of parcel size with death rates, urbanization, income levels, regulatory uncertainty, and availability of financial assistance. We know of no published research that has offered a theoretical framework for predicting forest ownership patterns and only a handful of studies that have quantified historical changes in ownership over time. Therefore, our approach in this chapter is to use information from existing studies on landowner behavior to explore the potential implications of a set of alternative futures (chapter 2). The analysis of ownership change relies heavily on surveys of forests and forest owners. We use forest inventory data from the Forest Inventory and Analysis (FIA) Program of the Forest Service, U.S. Department of Agriculture (Bechtold and Patterson 2005) for foundational data on broad ownership classes; and the FIA National Woodland Owner Survey (Butler and others 2005) for insights into the characteristics, attitudes, and behaviors of family forest owners. Attributes examined include parcellation and its impact on resource availability, absentee ownership, public access to private lands, and intergenerational land transfers. We rely on existing literature and expert interpretation to describe potential consequences. Our examination of the forest products industry divestiture involved use of an ownership database and geographic information system output from Lanworth, Inc., to generate estimates of total acres of ownership classified into the following categories: forest products industry, TIMOs, REITs, and other corporations. We use summaries of these data to evaluate totals and changes by subregion and State for 1998, 2003, and 2008. Although not entirely consistent with FIA records, the Lanworth database provides an index of change that is consistent across all Southern States for the selected time periods. We base our discussion of the determinants of landownership change on a recent analysis of timber industry trends in the South. Our goal is to develop insights on the potential management and use implications of ownership changes by evaluating recent and ongoing research on structural dissimilarities of management by different types of forest ownership. Private forest owners—Families, individuals, corporations, and other private entities that own forest land (Butler 2008). Corporate (private corporate)—An ownership class of forest land that is owned by entities that are legally incorporated (Smith and others 2009). This includes forest products industry, real estate investment trusts, and timber investment management organizations. Family—Families, individuals, trusts, estates, family partnerships, and other unincorporated groupings of individuals who own forest land (Butler 2008). Other private—Private forest owners other than corporations, families, or individuals. This category includes Native American lands, unincorporated partnerships, and clubs. Public forest owners—Forest land managed by Federal, State, or local government agencies. Federal—An ownership class of public lands administered by Federal Government agencies (Smith and others 2009). Examples include the U.S. Forest Service, Bureau of Land Management, National Park Service, Fish and Wildlife Service, and Departments of Defense and Energy. State—An ownership class of public lands owned by States or lands leased by States for more than 50 years (Smith and others 2009). Local—An ownership class of public lands administered by counties or local public agencies, or lands leased by these governmental units for more than 50 years (Smith and others 2009). Comparisons of forest conditions across ownership types are derived from FIA inventories, which are coordinated at the State level by crews measuring conditions on permanent forest inventory plots (Bechtold and Patterson 2005). The current design of the FIA inventory in the South involves a 5-year measurement cycle, with 20 percent of a State’s plots visited every year. We base our analysis on the most recent surveys within each of the 13 Southern States and on forecasts of forest inventories (chapter 5). As a complement to its biophysical information, the FIA National Woodland Owner Survey collects information on: who owns the forest, why they own it, how they use it, and what they intend to do with it. From 2002 to 2006, the years of the data used in this chapter, 5,517 southern family forest owners responded to the survey representing a cooperation rate of 45 percent (Butler and others 2005; www.fia.fs.fed.us/nwos). The selection procedure for the survey is identical to that used to conduct the FIA forest inventory: (1) each State is divided into 6,000-acre hexagons, and within each hexagon a sample point is randomly placed; (2) remote sensing and ground truthing determines whether the point is forested, and if so, the landowner is identified through property tax records; (3) if the forest owner is private, then they are included in the sample, and 20 percent of them are contacted each year. Because FIA inventories are conducted on a 5-year or longer rotation, rapid changes associated with forest products industry lands divestiture will be reported with a lag. To track the most recent changes in corporate ownership, we used the Lanworth proprietary databases of ownership and ownership transactions to estimate changes in the acreage owned by various corporate types of owners and the spatial distribution of those types. Lanworth created three datasets for the South: (1) total acres classified into four corporate ownership subgroups by State for 2008; (2) total acres classified into four corporate ownership subgroups by State for 2003 and 1998; and (3) generated area density maps by county for the subgroups in 2008. (1) Forest products industry (also known as vertically integrated timber products companies)— Publicly traded as well as privately held organizations that produce paper and/or wood products from forest resources and own or lease more than 100,000 forest acres across the South. (2) Timber investment management organizations (TIMOs)—Management companies that aid institutional investors in buying, selling, and managing their timberland investments. This category includes professionally managed funds which have 100,000 acres or more across the South. (3) Real estate investment trusts (REITs)—Corporations that use the pooled capital of many investors to purchase and manage property. This category includes public and privately held REITs with assets of 100,000 acres or more across the South. Note that these data were compiled before Weyerhaeuser Corporation transitioned from a vertically integrated timber products company to a REIT. (4) Other corporate—All other corporate businesses that have 100,000 acres or more of forest land across the South. There are 32 million acres of publicly owned forests across the Southern United States; these acres represent 14 percent of the total forest land area (figs. 6.1 and 6.2). The agencies that control these lands include the U.S. Forest Service, the U.S. Fish and Wildlife Service, and the U.S. Department of Defense as well as various State and local government agencies. These forests are not subject to development pressures as private lands are, but they are subject to the needs of society and the resulting laws and regulations that govern their use. By all measures, the South is dominated by private ownership. Over 5 million private forest owners across the region hold 200 million acres of forest land, 86 percent of the total forest land area. Within this category is a diversity of owners ranging from large, multi-national corporations with acreage in the hundreds of thousands to families and individuals with a few acres. On average, families and individuals own two out of every three acres of private forest land. The remaining one-third of the private acreage, 66 million acres, is owned by corporations, conservation organizations, partnerships, and tribes; and it is the corporations that own the bulk of these acres. Within this corporate category are the traditional, vertically integrated timber products companies, but an increasing amount of acreage is owned by TIMOs and REITs. Organizations in the other private ownership category have a diversity of reasons for owning forest land. Conservation organizations may own particular parcels to protect special features of the landscape. Many camps and churches own land to offer their members rustic and secluded environments. Hunting and other clubs may own land for specific recreation purposes. 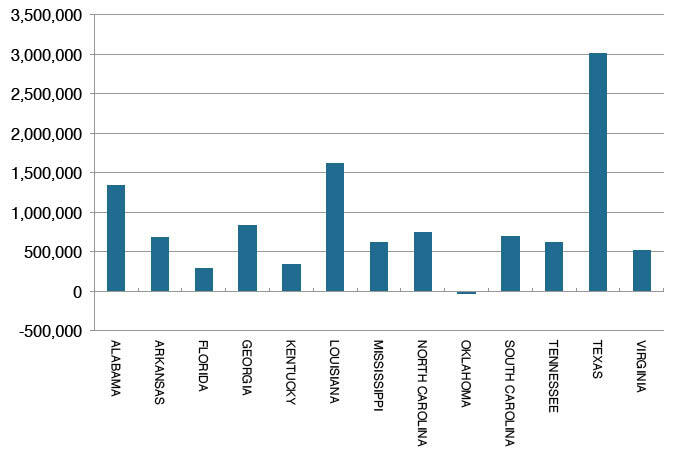 Figure 6.1—Forest ownership across the Southern United States, 2006. 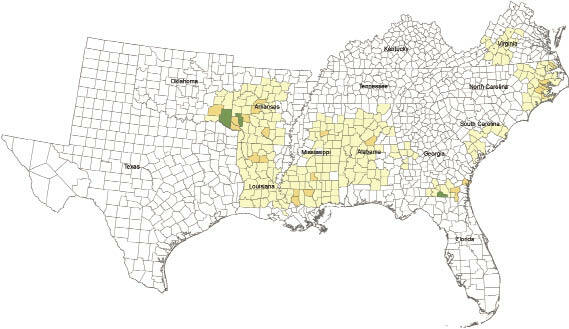 Figure 6.2—Distribution of forest ownership (percent) in the Southern United States, 2006. There are two very distinct ways of looking at family forest owner statistics: numbers of owners and numbers of acres. 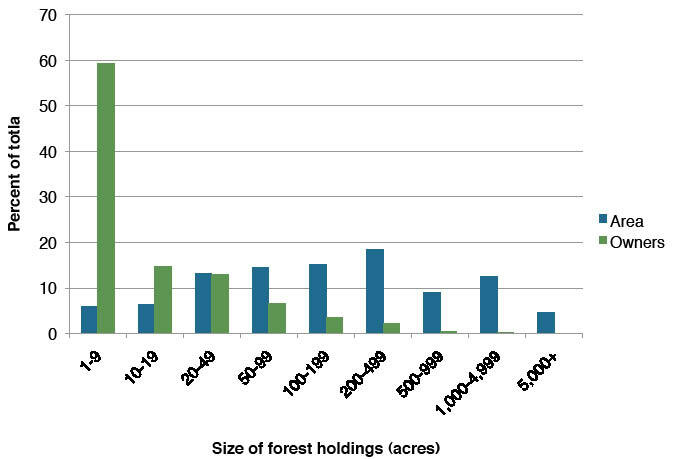 Looking at the distribution of family forest owners by size of forest holdings (fig. 6.3) shows that nearly 60 percent of family forest owners own between 1 and 9 acres. But looking at the distribution of acres shows that 60 percent of all family forest land is in holdings of 100 acres or more. Both ways of looking at the data can be useful, depending on the topics being addressed; often they should be considered together. 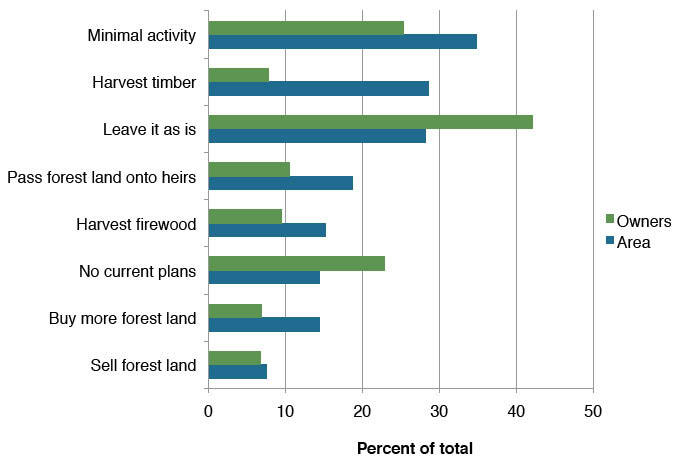 On an acreage basis, family legacy, aesthetics, and land investment are the primary reasons that family forest owners give for owning forests (fig. 6.4). On an ownership basis, aesthetics, part of home, and privacy are the most important reasons. Knowing their reasons for owning is important for learning what motivates people and leads into what their concerns are—critical information for understanding, communicating with, and assisting family forest owners. When trying to understand owners, it is also important to be cognizant of the demographics involved. Compared to the general population, family forest owners tend to be older, better educated, and have higher incomes. According to the National Woodland Owner Survey statistics, 69 percent of family forest owners are men. A caveat needs to be added about the instructions on the survey, which specified that one person, the primary decision maker, answer the questions. If that person was a married man, there would be no way to indicate if his wife is a co-owner of the land, possibly skewing the results on gender. Although timber production is not a primary objective of most family forest owners, two-thirds of all family forest land is owned by people who have commercially harvested some of their trees. But only 18 percent of the family forest land is owned by someone who has a written forest management plan. The number of owners who have received management advice is significantly higher, but at 42 percent, still represents less than half of all family forest land. The numbers are even less encouraging when viewed from the number of owners perspective: only 3 percent of the family forest owners have a written management plan and only 13 percent have received forest management advice. These data raise important questions about owners’ abilities to maximize benefits from their land and decrease the likelihood that they are leaving it in the best possible shape to meet future needs. (fig. 6.6). It is at this point of transfer that land use often changes, as well as changes in management practices. 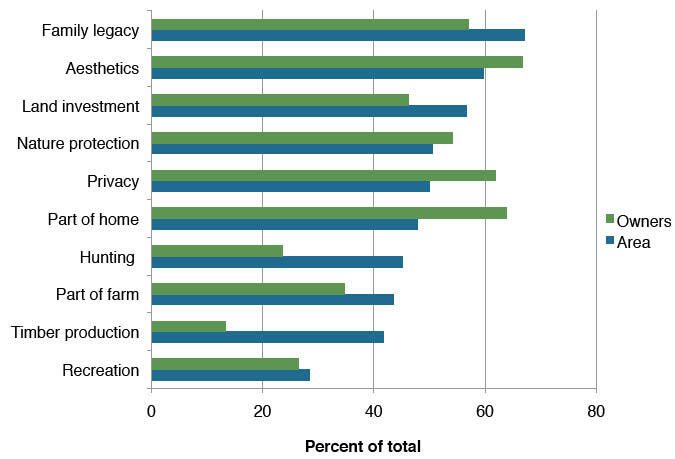 Family legacy is an important objective, but it is also a major concern (fig. 6.7); owners are uncertain about their heirs’ desires to keep the land, whether they can afford to hold it, and whether an equitable transfer will be possible. The often stark contrast between acreage and ownership statistics, as shown by differences in the relative ranking of ownership objectives or other characteristics, is an indication that the size of forest holdings is important. Size is the single most predictive variable collected on the National Woodland Owner Survey. The average size of family forest holdings is 29 acres. Economies of scale can make it difficult to implement traditional forestry tools on small acreages, and in some circumstances, traditional prescriptions will conflict with owners’ objectives. Continued parcellation of forest holdings will likely exacerbate these issues. Averages can be misleading and are usually not the best way to understand large, diverse groups. To determine whether naturally occurring subgroups of family forest owners exist, the Sustaining Family Forest Initiative conducted a multivariate, hierarchical analysis that identified four attitudinal subgroups: woodland retreat, working the land, supplemental income, and uninvolved owners (Butler and others 2007). Woodland retreat owners are most interested in the amenity values their forests provide and more likely to have their home associated with their forest land. Working the land owners are multiple objective owners; they are interested in a combination of amenity and financial values. Supplemental income owners are interested in earning money from their land, either through timber harvesting or land sales, and tend to have larger properties. Uninvolved owners tend to not have strong ownership objectives. Understanding the desires and concerns of these subgroups will improve policies, programs, services, and outreach efforts aimed at forest sustainability. Figure 6.3—Percent of family forests by total area and number of owners in each of nine size classifications for the Southern United States, 2006. 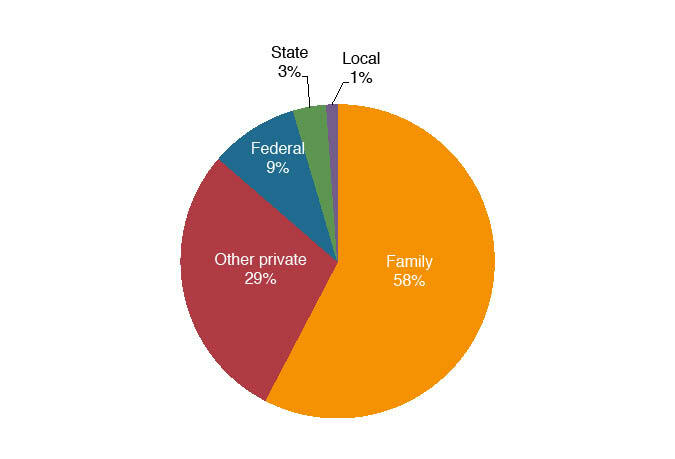 Figure 6.4—Reasons for owning southern family forests as a percent of total area and total number of owners, 2006. Figure 6.5—Length of ownership of southern family forests as a percent of total area and number of family forest owners, 2006. Figure 6.6—Future plans of southern family forests as a percent of total area and number of family forest owners, 2006. 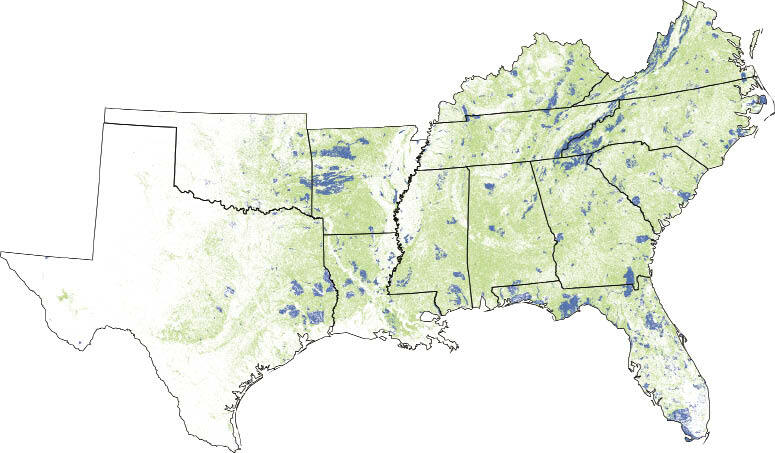 Figure 6.7—Concerns of southern family forests as a percent of total area and number of family forest owners, 2006. Dynamics of family forest ownership patterns happen across different spatial and temporal scales. At the broadest scales, family forest ownership is fairly stable. But within this group, many family forest owners are selling or otherwise transferring land to other family forest owners, either within their families or outside of them. Family forest ownership dynamics are the result of a combination of personal/familial circumstances and broader social factors and market conditions. Most family forest owners have a deep love of their land. They know why they own it, and many know what they want for the future of their land, but many will also be confronted with challenges and opportunities, only some of which are known. Because of increasing population pressures and ensuing increases in property values, owners can be faced with increased taxes, increased offers for their land, and changes in the rural environment. Family legacy is an important objective for many family forest owners, but may also be one of their greatest concerns and challenges. For many family forest owners, their property is their largest financial asset. If medical, educational, or other expenses arise, they may be forced to do things with their land than they would not do otherwise. And even for those who have no immediate financial needs or objectives, a (seemingly) lucrative offer can be difficult to refuse. In the late 1990s, the forest products industry held about 20 percent of the forest land in the South (Conner and Hartsell 2002). Since then, this ownership subgroup has dropped to less than 5 percent, representing the most rapid recent change in forest ownership and management. This loss resulted mainly from companies selling their forest assets and sometimes changing their corporate structure. Regardless of approach, however, these transactions fundamentally altered how the involved forests and land were managed. Separating forest management from the forest processing industry changes both the long-term objectives of owners and the structure of forest investments. According to the Lanworth data, corporate ownership changed dramatically from 1998 to 2008 (fig. 6.8) and has continued to change since then—an example is the Weyerhaeuser Corporation conversion from a vertically integrated timber products company to a REIT in 2010. During that period, the forest products industry ownership declined by roughly 70 percent from 23.4 million to 7.5 million acres (table 6.1). TIMOs captured most of these lands as their acreage increased from 2.2 million to 13.4 million acres. 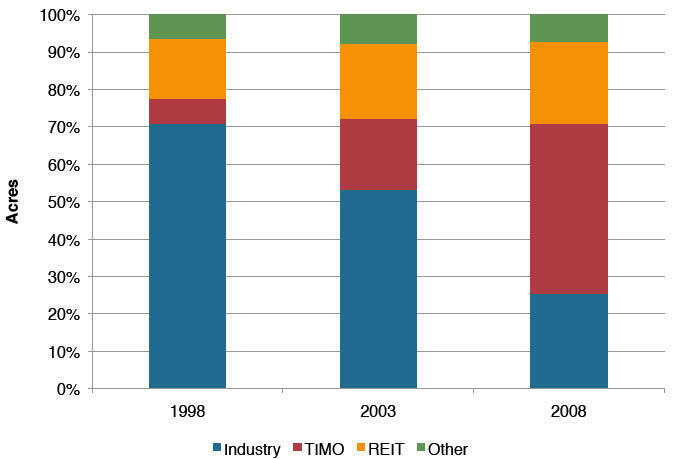 The holdings of REITs increased by about 20 percent while the “other corporate” ownership remained relatively constant. The total corporate forest ownership group as defined by Lanworth declined by about 10 percent over this period, ostensibly as non-corporate entities acquired some lands during divestiture. For example, we know that conservation organizations such as The Nature Conservancy acquired some of the land offered in these sales. 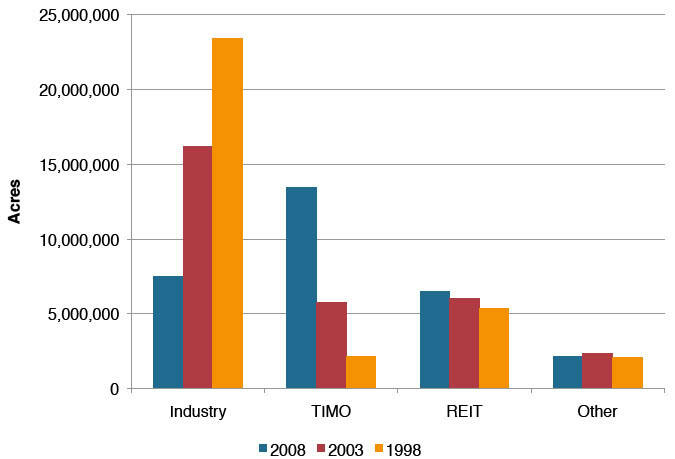 From 1998 to 2008, TIMO acreage grew from 7 percent to 45 percent of the corporate ownership group (fig. 6.9). This change mirrors the decline from 71 percent to 25 percent in forest products industry holdings over the same period. These changes are not evenly spread across the South. Texas had the greatest decline of forest products industry ownership (about 3 million acres) while Alabama, Georgia and Louisiana lost about 2 million acres each (fig. 6.10). Increases in TIMO ownership were similar to regional trends with gains of 3 million acres in Texas, 1.5 million acres in Louisiana, and 1.6 million acres in Alabama (fig. 6.11). The spatial distribution of corporate owners also differs by type of owner. The forest products industry is most heavily focused in south central areas—in Arkansas, Louisiana, Mississippi, and Alabama (fig. 6.12). REITs are concentrated in these same States but their ownership also extends into Georgia, Florida, and South Carolina (fig. 6.13). TIMO ownership is even more diffuse but has an especially high concentration in eastern Texas and the west central parts of Louisiana (fig. 6.14). The causes behind the divestiture of forest products industry lands are debated and likely have varied across the many corporations involved. Forest-land divestitures involve dismantling vertically integrated operations in the wood products industries, in effect disintegrating company missions by dissolving the bond between timber growing operations from wood processing operations—indicating a change in the perceived economic advantages of maintaining the production of raw materials within the corporate boundary. We can assume that the vertically integrated companies had realized benefits that exceeded the costs incurred by coordinating two very different business models (also known as transaction costs). To understand the causes of the divestitures we must understand how the benefits of holding timberland area diminished relative to these transaction costs. To be sure, this trend toward disintegration is not limited to forestry and was especially pronounced in banking, information technology, and manufacturing sectors of the economy. The following paragraphs describe some of the key factors that may have influenced decisions to sell. Consolidation through mergers and divestitures—Multiple acquisitions and consolidations occurred in the forest products sector ahead of forest-land divestiture. Corporations merged and then consolidated their production around fewer product lines. This shift away from horizontally integrated manufacturing may have reduced the amount of timber from corporate land that could be effectively processed into products. Acquisitions also generated considerable debt that could be reduced through land sales. Alleviation of timber scarcity concerns—A fundamental change in perceptions about timber supplies occurred during the 1990s, with focus shifting from impending scarcity of raw materials to a view that private owners are price-responsive and reliable in supporting increased demands for production (Wear and Prestemon 2004). Changes in production technologies may have also contributed to alleviating concern about scarcity, as oriented strand board and other new products can be produced with smaller logs than required by older products such as plywood. In times of scarcity, forest products industry land could buffer short-term market shortages, but in the face of resource abundance, this insurance value of company timberlands would diminish considerably. Transaction technologies—New information technologies that reduce the costs of transacting and finding sellers of materials have had far-reaching effects on the structure of production in many sectors of the economy. The best example of this ability to reduce transaction costs within the wood products sector may be the development of Geographic Information Systems that can sift through satellite imagery and ground based inventories to “discover” new sources of timber. These systems can leverage the efforts of procurement foresters to be quicker at locating owners with marketable timber and therefore reduce the costs of procuring timber on open markets. In effect, technology can make supply less uncertain, thereby reducing the insurance values of holding timberland. Globalization—Much has been written about the effects of globalization on the U.S. economy. Favorable terms of trade, structural changes in governance, and shifts in comparative advantage, combined with the developments in transaction technologies described above, have all contributed to global shifts in production. But although expanded trade may affect the optimal scale of a company (by changing the extent of markets), increased trade alone does not necessarily affect its optimal structure as much as other aspects of globalization. To illustrate, globalization increasingly captures what Grossman and Rossi-Hansberg (2006) call an emerging “trade in tasks” among regions and countries. They argue that technological changes (primarily information technologies that enable communication of precise specifications coupled with transportation systems that offer timely delivery) have allowed the production process to be broken into smaller staged tasks that can be performed in disparate locations. This encourages the separation of production stages—such as wood growing and wood product manufacturing—which has been observed in increased exports of U.S. hardwood lumber for the manufacturing of furniture (Wear and others 2007). Taxes—A key factor in divestiture transactions has also been differential taxation that factored into forest products industry decisions to hold versus dispose of forests. Wood products companies, like other corporations, are required to pay corporate income taxes on their revenues and shareholders pay capital gains and income taxes, resulting in an oft-cited double taxation of returns. Most of the individual investors, pension funds, and other institutions that have purchased forest products industry timberland through TIMOs are not subject to the corporate income tax. This difference in total tax burden means that investors would place a higher value on timberland than a wood products company, whose timber growing income is reduced by taxes. Until recently, the forest products industry valued timberland based on the economics of timber growing and on values related to supply assurance and uninterrupted production. As this premium dissipated, wood products companies saw the value of selling their timberlands and thereby capitalizing on the preferential tax treatments of pension funds and other investors. Figure 6.9—Proportion of corporate forest ownership by subgroup, 1998, 2003, and 2008. Source: Lanworth Inc. On file with: David Wear, U.S. Department of Agriculture, Forest Service, North Carolina State University, PO Box 8008, Raleigh NC, 27695. Under all future forest projections, the area of forest land is expected to decrease. Public lands are scarce in the South, and the nature of public ownership virtually eliminates the likelihood of significant acreage decreases in this group. Therefore, the loss, which ranges from 5.5 million to 21.1 million acres, will be concentrated on private lands. Under Cornerstone D, a prediction of moderate forest loss (chapter 5), the South is projected to lose 12.2 million acres of private forest land. The largest decreases, in both percentage and absolute terms, are in Florida, Georgia, and North Carolina—States with the largest projected increases in population and urbanization. 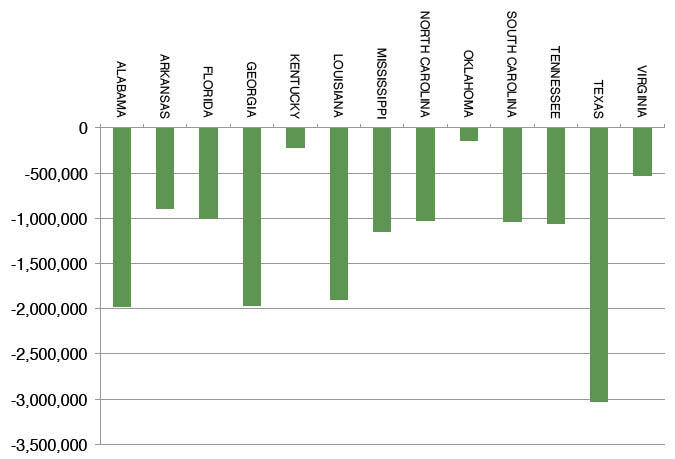 All States are projected to lose forest land under Cornerstone D, but at between 4 and 6 percent, losses for Alabama, Arkansas, Louisiana, Mississippi, and Texas are projected to be lower than the regional average. This pattern of change for the region as a whole and for individual States holds for other Cornerstones as well (chapters 3 and 4). Although the net area of forest land is projected to decrease, the area of some forest types is expected to increase. The area of planted pine could increase between 20 percent and 72 percent to as much as 33 percent of total forest area over the 50-year projection period. Increases in planted pine are expected across all ownership groups, but the greatest acreage gains are on private forest lands. Modeling restrictions preclude disaggregation of changes into specific private ownership groups. But planted pine requires an upfront investment, which in the South at least, is a general indicator of owner intent—commercial production of timber. What then are the implications for corporate lands of these transactions and the factors that have driven them? Perhaps most importantly, changes in production and transaction technologies suggest that timberland assets will likely be much more liquid in the future. This trend is reinforced by the form of new ownerships and the structure of many investment vehicles for timberland—large shares of timberland portfolios are commonly held as closed end funds that must be sold after a specified time period (Zhang and others 2012). There is little reason to believe that we have observed a once-only episode in timberland sales. Rather, the emerging investment models for forests indicate that timberland will be traded much more frequently in the future than ever in the past. More rapid turnover of timberland might eventually raise concerns about the stability of timber markets. It seems clear that the transition from large-block ownership by the forest products industry is irreversible. Because technological changes have permanently changed cost structures, the capacity and desire for internal control of timberland have likely been permanently eroded. Furthermore, because divestiture often results in fragmentation of ownership, it is quite unlikely that any future owner could stitch together a forest estate comparable to the pre-divestiture holdings. Forest land provides many social benefits beyond timber production, including watershed protection (chapter 13), biodiversity (chapter 14), and recreation (chapters 7 and 8). Increased timberland liquidity suggests the possibility of changes in the availability of these benefits. Large-block industrial ownerships provided many conservation benefits, including some of the largest contiguous stretches of forest habitats in the South (Wear and Greis 2002). They provided de facto protections for resource sustainability that is now less certain as timberland ownership becomes more fragmented. TIMOs may seek to diversify the risks associated with their forest holdings, providing a strong disincentive for the practice of holding land in the large contiguous blocks that was typical of forest products industry owners. Risk management strategies spread investments across space (e.g., to avoid damage from hurricanes and fires) and perhaps across species (to mitigate, for example, losses from insect and disease outbreaks)—both of which would also address market-based financial risks, but at a cost of increasing forest parcellation and eventual forest fragmentation. It is important to remember that the investors represented by TIMOs came very rapidly into forest investments based on the perception of countercyclical returns and the attractiveness of land as an investment. Changes in these perceptions and valuations might just as easily lead them away from forest investments. Again, the implication of their actions is increased liquidity of forest assets and more rapid change in landscape conditions in the future. The economic downturn of 2008 to 2009 is a reminder that external conditions can rapidly change the relative position of various investments. Future conservation strategies need to anticipate these changes in corporate owned forests. Divestiture provided a unique opportunity for conservation purchases of unprecedented size (Weinberg and Larson 2008). Still the ability to protect biodiversity, water, and other values that depend on large blocks of contiguous forest have been and will continue to be challenged by these forces that fragment forest ownership. Effective conservation in these dynamic landscapes may require new approaches, for example, emerging partnerships between investment and conservation interests. The future of family forest lands depends on personal, familial, social, and market forces that will unfold with the inevitable land transfers from one owner to the next. 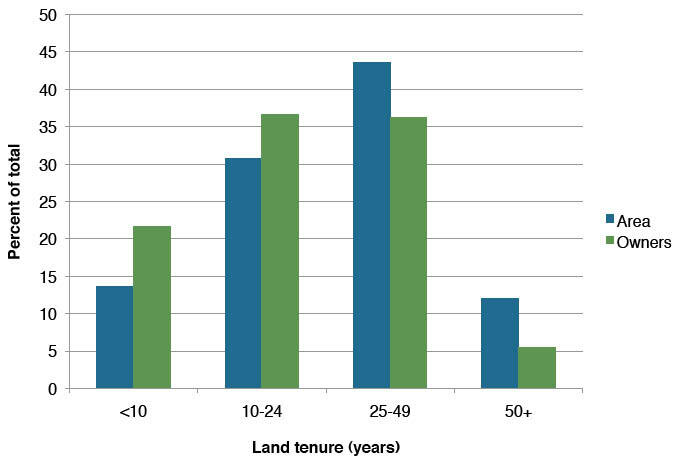 It is at these points of transfer when land use and forest management are most likely to change. Although many family forest owners want to keep their land intact for future generations, they are not certain they will be able do so. Mater and others (2005) showed that many of the next generation owners are not attached to the land and have little interest in maintaining the family legacy, implying another tendency toward liquidity. That being said there are still many potential heirs and new owners who are interested in maintaining the land in forest cover. Continued population pressures and the continued desire of people to want to live in the country will continue the parcellation of family forest land. And with parcellation often comes new development, such as homes and the roads and other infrastructure that they require. This will create challenges for wildlife, wildfire control, recreation, and forest management. Not only will the parcels be smaller, they will also more likely be surrounded by development, which can create regulations or other obstructions that further hinder traditional management practices. It is uncertain who the future family forest owners will be, but given historic trends, there will likely be more of them, the average size of their forest holdings will decrease, and the importance of amenity values will continue to increase. It is also likely that more of them will have urban or suburban backgrounds and be absentee owners. Although many will still be willing to harvest trees from their land, if current trends of smaller parcels and changing objectives continue, harvesting is likely to decrease. And it is likely that land values, either monetary or non-monetary, will continue to increase for recreation (such as hunting), nontimber forest products (such as pine straw), water protection, carbon sequestration, and other nontraditional uses. Family forest owners will continue to dominate the forested landscape of the South for the foreseeable future. Many of the growing pressures on landowners will be felt by family owners first and most intensively. Therefore it behooves all who are interested in the future of the South’s forests to understand this group of owners, their dynamics, and the factors affecting them. In effect, they hold the future of southern forests in their hands and need assistance if they are to continue their tradition of stewardship. We need to be cognizant of owners’ objectives and circumstances. Whether they own a 10-acre home lot or a 400-acre investment property will have a large impact on what issues are important to them, the use/management that they deem appropriate, and what can be done with their land. In short, there will be an urgent need to develop programs and tools that are tailored for specific types of family forest owners—providing them what they need, when they need it, and how they want it—so that family forest owners can continue to provide the goods and services that society has come to expect. Unlike the western regions of the United States, the South’s forests are dominated by private owners. Private ownership is diverse with roughly a third in corporate ownership and the remainder owned by more than 4 million families or individuals. Forest holdings vary considerably in size with most owners (59 percent) holding fewer than 10 acres. Most forest land (60 percent) is however, in holdings of 100 acres or more. Forecasts indicate a loss of 5.5 million to 12.2 million acres of private forest land in the South by 2060. With expanded urbanization growing outward from city centers, we expect an increased fragmentation of remaining forest holdings. Ongoing parcellation through estate disposal and the tax increases associated with urbanization will continue to alter forest management in the South. In particular, areas of concentrated urbanization could begin to see reductions in timber harvesting and planting in small inoperable holdings, and reductions in prescribed burning because of health and safety concerns and ordinances. Family forest owners cite a variety of reasons for holding forests. These include legacy, aesthetics, and land investment. About two-thirds of family forest land in the South is held by owners who have harvested timber from their forests in the past. When combined with corporate ownership, about 8 of every 10 acres of private forest land in the South are owned by corporations, families, individuals, or others who have commercially harvested. The divestiture of forest lands by the forest products industry from 1998 to 2008 is the most substantial transition in forest ownership of the last century. This divestiture substantially altered the ownership and objective structure of the corporate ownership group because much of the land shifted to TIMO and REIT owners. A number of economic factors likely influenced the decisions of forest products companies to sell their land. An analysis of these factors suggests that the transition from large block industry ownership to a more spatially varied and fragmented ownership is irreversible in the foreseeable future. As a result of transition from the forest products industry to TIMOs, corporate owned forest land is now a more liquid asset that could trade more frequently in the future, and the size of individual holdings could continue to decline. While the forest products industry land base had been a stable and predictable component of the southern landscape, the “new” class of corporate forest lands may be less stable and more changeable with implications for nontimber values, such as water quality, sensitive plant and animal communities, and recreation availability. The economic forces that led these new forest owners to acquire land could cause rapid shifts in ownership in the future. For example, a sustained decline in commodity prices, such as the 50 percent reduction in softwood pulpwood prices since 1998 (chapter 4), could reduce the profitability of timberland management and drive away investors. Conversely, policy driven increases in biomass demands for energy production or the emergence of additional revenues from markets for ecosystem services could reverse recent downward trends (chapter 10). Over the past 2 decades, ownership dynamics have been largely among owner types within the corporate and family owner groups (and not from one group to another). Our analyses of anticipated changes are consistent with this history. Structural changes in ownership—transferring land among major groups—might be possible depending on the driving forces, and would have far reaching effects. For example, increasing scarcity of recreation and concern for other quality-of-life aspects of forests could lead to public acquisition of private forest land, especially at State and local levels. A substantial decline in timberland profitability could lead to a shift in ownership from corporate to family forest owners. These are both within the realm of plausibility but have not yet been observed to any great degree. Tax policy has had important influence on the structure of corporate forest ownership, notably the shift from industry to other forms of corporate owners. Policy in the form of income and property taxes likewise influences the allocation of land to forests and other uses and affects the optimal scale of forest uses. Environmental regulations can affect the feasibility of forest management thereby affecting the extent of commercial ownership. What’s more, inheritance taxes influence the retention of large forest areas through generational transfers. These and other policy impacts on the type of ownership and parcellation of forests are discussed in chapter 11. A number of questions remain about implications of changes in the corporate forest ownership group for forest management and forest conditions. In particular we posit that the change from forest products industry to TIMO ownership increases the liquidity of forest assets and that this might affect the long-term conditions of forests. Frequent sales of timberland could conceivably decrease the likelihood of long-term investments in forest production and productivity. Conversely, investments in these assets could lead to improvements that would be valued in future transactions because those investments would be fully capitalized in the sale prices of timberland. If so, efficient long-term investment would not be impeded by frequent land sales. This is a crucial question for the future of forests in the South, and one that could be answered through regular monitoring and analysis of timberland transactions over time, perhaps in concert with forest inventories. Land use (and other land ownership) systems for projecting ownership dynamics typically use very simplistic assumptions because they lack solid theoretical modeling frameworks and empirical data for parameterizing and validating models. Building on existing land-use change and forest-management behavior models (Agarwal and others 2002, Beach and others 2005, Pocewicz and Nielsen-Pincus 2008) should pave the way for a first approximation of an ownership dynamics model. Full implementation of the newly designed annual FIA inventory system will add data to help resolve issues surrounding broad-scale ownership dynamics, but additional work will be needed to examine the dynamics within ownership groups. Most immediately, the transfer of lands from vertically integrated timber products companies to TIMOs and REITs and the intergenerational transfer of family forest lands are important dynamics that need to be better understood and monitored. assessment of land-use change models: dynamics of space, time, and human choice. Gen. Tech. Rep. NE-297. Newton Square, PA: U.S. Department of Agriculture Forest Service, Northeastern Research Station. 61 p.
Barraclough, S.; Rettie, J.C. 1950. The ownership of small private forest-land holdings in 23 New England towns. Stn. Pap. 34. Upper Darby, PA: U.S. Department of Agriculture Forest Service, Northeastern Forest Experiment Station. 32 p.
Beach, R.H.; Pattanayak, S.K. ; Yang, J.C. [and others]. 2005. Econometric studies of non-industrial private forest management: a review and synthesis. Forest Policy and Economics. 7(3): 261–281. Bechtold, W.A. ; Patterson, P.L. 2005. The enhanced Forest Inventory and Analysis program—national sampling design and estimation procedures. Gen. Tech. Rep. SRS-80. Asheville, NC: U.S. Department of Agriculture Forest Service, Southern Research Station. 85 p.
Binkley, C.S. ; Raper, C.F. ; Washburn, C.L. 1996. Institutional ownership of U.S. timberland: history, rationale, and implications for forest management. Journal of Forestry. 94(9): 21–28. Birch, T.W. 1996. Private forest land owners of the United States, 1994. Resour. Bull. NE–134. Radnor, PA: U.S. Department of Agriculture Forest Service, Northeastern Forest Experiment Station. 183 p.
Birch, T.W. ; Lewis, D.G. ; Kaiser, H.F. 1982. The private forest land owners of the United States. Resour. Bull. WO–1. Washington, DC: U.S. Department of Agriculture Forest Service. 64 p.
Butler, B.J. ; Tyrrell, M.; Feinberg, G. [and others]. 2007. Understanding and reaching family forest owners: lessons from social marketing research. Journal of Forestry. 105(7): 348–357. Butler, B.J. 2008. Family forest owners of the United States, 2006. Gen. Tech. Rep. NRS–27. Newtown Square, PA: U.S. Department of Agriculture Forest Service, Northern Research Station. 73 p.
Butler, B.J. ; Leatherberry, E.C. ; Williams, M.S. 2005. Design, implementation, and analysis methods for the National Woodland Owner Survey. Gen. Tech. Rep. NE–336. Newtown Square, PA: U.S. Department of Agriculture Forest Service, Northeastern Research Station. 43 p.
Conner, R.C. ; Hartsell, A.J. 2002. Forest area and conditions. In: Wear, D. and Greis, J., eds. The Southern Forest Resource Assessment. Gen. Tech. Rep. SRS-53. Asheville, NC: U.S. Department of Agriculture Forest Service, Southern Research Station: 357-402. Conner, R.C. ; Adams, T.; Butler, B.J. [and others]. 2004. The state of South Carolina’s forests, 2001. Resour. Bull. SRS–96. Asheville, NC: U.S. Department of Agriculture Forest Service, Southern Research Station. 67 p.
Fletcher, L.S. ; Kittredge, D.; Stevens, T. 2009. Forest landowners’ willingness to sell carbon credits: a pilot study. Northern Journal of Applied Forestry. 26(1): 35–37. Germain, R.H.; Anderson, N.; Bevilacqua, E. 2007. The effects of forest land parcelization and ownership transfers on nonindustrial private forest land forest stocking in New York. Journal of Forestry. 105(8): 403–408. Grossman, G.M. ; Rossi-Hansberg, E. 2006. The rise of offshoring: it’s not wine for cloth anymore. In: The new economic geography: effects and policy implications. Kansas City, MO: Federal Reserve Bank of Kansas City: 59–102. Haynes, R.W. 2003. An analysis of the timber situation in the United States: 1952–2050. PNW–GTR–560. Portland, OR: U.S. Department of Agriculture Forest Service, Pacific Northwest Research Station. 254 p.
Hodgden, B.; Cusack, C.; Tyrrell, M. 2007. Literature review: an annotated bibliography of the literature on family forest owners. GISF Res. Pap. 002–R. New Haven, CT: Yale University, School of Forestry and Environmental Studies, Global Institute of Sustainable Forestry. 27 p.
Josephson, H.R. ; Mcguire, J.R. 1958. Ownership of forest land and timber. In: Timber resources for America’s future. For. Res. Rep. 14. Washington, DC: U.S. Department of Agriculture Forest Service: 289–321. Joshi, O.; Mehmood, S.R. 2011. Factors affecting nonindustrial private forest landowners’ willingness to supply biomass for bioenergy. Biomass and Bioenergy. 35(1): 186-192. Kilgore, M.; Leahy, J.; Hibbard, C.; Donnay, J. 2007. Assessing family forest land certification opportunities: a Minnesota case study. Journal of Forestry. 105(1): 27–33. Mater, C.M. ; Sample, V.A. ; Butler, B.J. 2005. The new generation of private forest landowners: brace for change. The Pinchot Letter. 10(2): 1–4. Mehmood, S.R. ; Zhang, D. 2001. 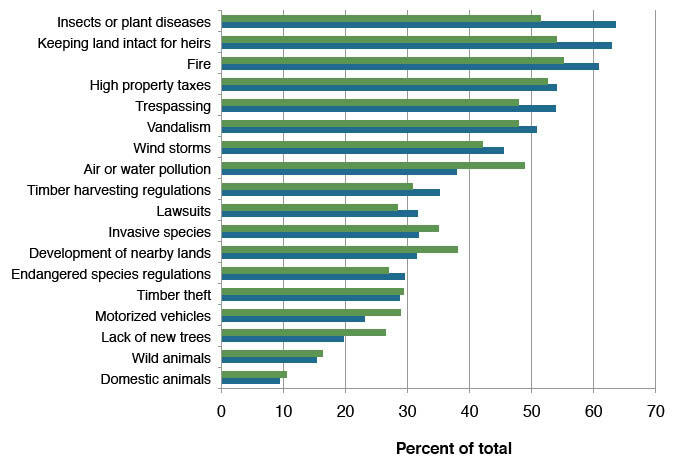 Forest parcelization in the United States: a study of contributing factors. Journal of Forestry. 99(4): 30–34. Pocewicz, A.; Nielsen-Pincus, M. 2008. Predicting land use change: comparison of models based on landowner surveys and historical land cover trends. Landscape Ecology. 23(2): 195-210. Smith, W.B. ; Miles, P.D. ; Perry, C.H. ; Pugh, S.A. 2009. Forest resources of the United States, 2007. Gen. Tech. Rep. WO–78. Washington, DC: U.S. Department of Agriculture Forest Service. 336 p.
Snyder, S.A.; Kilgore, M.A. ; Taff, S.J. ; Schertz, J.M. 2008. Estimating a family forest landowner’s likelihood of posting against trespass. Northern Journal of Applied Forestry. 25(4): 180–185. Wear, D.N. ; Carter, D.; Prestemon, J. 2007. The U.S. south’s timber sector in 2005: a prospective analysis of recent change. Gen. Tech. Rep. SRS–99. Asheville, NC: U.S. Department of Agriculture Forest Service, Southern Research Station. 29 p.
Wear, D.N. ; Prestemon, J. 2004. Timber market research, private forests, and policy rhetoric. In: Rauscher, M.; Johnsen, K.; Doudrick, R., eds. Southern forest science: past, present and future. Gen. Tech. Rep. SRS–75. Asheville, NC: U.S. Department of Agriculture Forest Service, Southern Research Station: 289–300. Chapter 24. Wear, D.N. ; Greis, J.G. 2002. Southern Forest Resource Assessment. Gen. Tech. Rep. SRS–53. Asheville, NC: U.S. Department of Agriculture Forest Service, Southern Research Station. 635 p.
Weinberg, A.; Larson, C. 2008. Forest land for sale: challenges and opportunities for conservation over the next ten years. New York: Open Space Institute, Inc. 22 p.
Zhang, D.; Butler, B.J. ; Nagubadi, R.V. 2012. Institutional timberland ownership in the U.S. South: magnitude, location, dynamics, and management. Journal of Forestry 110(7): 355-361. The term family forest owners refers to “families, individuals, trusts, estates, family partnerships, and other unincorporated groups of individuals that own forest land” (Butler 2008). Wear, D.N. 2010. The disintegration of timber growing and wood products manufacturing in the United States. Draft manuscript on file. U.S. Department of Agriculture, Forest Service, 3041 Cornwallis Rd., Research Triangle Park, NC, 27713. In 1998, FIA’s continuous design of periodic inventories (in place since the 1930s) was replaced by the annual inventory system. Full implementation of the annual system requires Federal appropriations as well as supplemental funds from each State. In practice, the cycle can range from 5 to 10 years, with more Southern States having approached full implementation than States in other regions. We defined the concentration of ownership by calculating the ratio of ownership acres to total forest acres in each county. High concentration counties are among the top third of these ratios, moderate is defined by the middle third, and low is defined by the lower third. Wear, D.N. 2010. The disintegration of timber growing and wood products manufacturing in the United States. Draft manuscript on file. U.S. Department of Agriculture Forest Service, 3041 Cornwallis Rd., Research Triangle Park, NC, 27713. TIMOs also manage open-ended investor accounts without a predetermined holding period. It is too early to determine how these changes in ownership will be translated into changes in on-the-ground forest management. Shifts in management are uncertain and will ultimately hold strong influence over the future path of forest conditions in the South.